This form must be completed by all masters of under 10 metre fishing vessels with a shellfish entitlement. 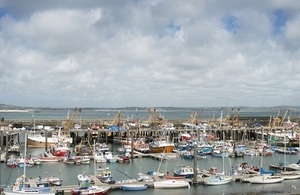 Use this form to apply for a licence for a British-registered fishing vessel. Use this form to combine or separate a vessel licence or entitlement and use the component parts of the licence or entitlement. Vessels 10 metres and under must notify how much nephrops they caught and landed from areas IIa, IV, VI and VII for each trip each week. Details and forms for transferring fixed quota allocation units and getting a new holding statement.